At Vision Summit 2017, UK-based Rewind, one of the recent additions to the Microsoft HoloLens Agency Readiness Partner Program, showed off a HoloLens application called "Flight Deck" that genuinely blew me away. The idea of watching a live-action sports experience on a coffee table has been explored and mocked up, but Rewind not only has done it, they will be releasing it later this year. The Red Bull Air Race is a sporting event that combines low-altitude, high-speed flying with extreme maneuverability. With a race course made out of massive inflatable pylons, the pilots dodge and weave through the obstacles, and in the end, fight to have the shortest completion time in the competition. Rewind, in a partnership with Reb Bull, has created an application that will allow users to combine HoloLens with 2D screens to create a whole new type of viewing experience for the Red Bull Air Race. 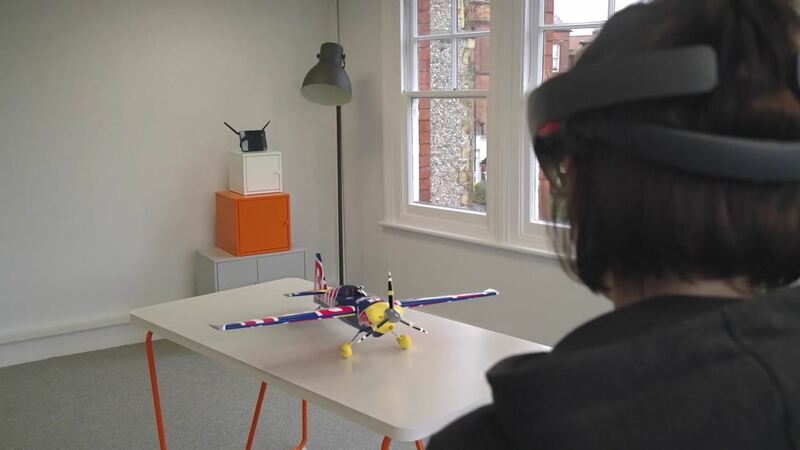 In the HoloLens, the user can actually put the race course on a coffee table or likely even the floor — for a real bird's eye view — and watch in real time as the pilots make their maneuvers at 10 g.
The planes that are used in the Air Race are fitted with special devices that output positional, rotational, and other types of information. Rewind is able to use this information to recreate the player's movements, including penalties for hitting the specially made inflated pylons, which are cut through with razor blades on the wings. All of this is shown in the 3D on any surface of the user's choosing. Last week at Microsoft Build 2017, I had the opportunity to try the experience and was nearly as impressed with the actual experience as I was with the video demo shown at Vision Summit. In light of the world of amazing marketing that we live in, rarely does the demo and experience line up so well (minus the pseudo-dubstep, of course). When the air race is over, you can even pull up a 3D model of one of the planes at a 1 to 1 scale — a full-size racing plane sitting in your living room. Impressive. There's no word yet on when Flight Deck will hit the Windows Store for HoloLens, but hopefully soon since the next race in the Red Bull Air Race 2017 season is coming up at the start of June. A really rubbish video they've managed to throw together. So poorly conceived and cut it doesn't help their cause one bit. I'm sure the actual experience is much much better.